it’s been over a week and the anger persists. every time i think about it, i still start to boil over in a fit of rage. and if you’re an american soccer fan, i don’t doubt that you feel the exact same way. and all this hate can be attibuted to just one man. yes, i’m speaking about you, koman coulibaly. could this man be a terrorist? i think so. in case you’ve been living under a rock, i’m speaking about the referee in charge of last friday’s critical second round game between the USMNT and algeria. 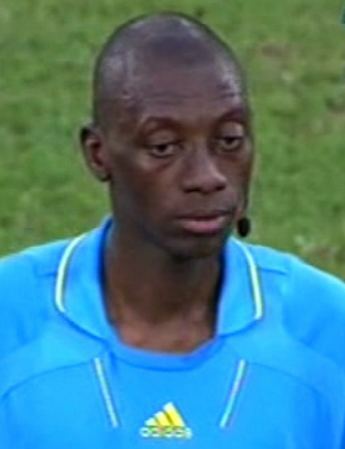 the woman man from mali put in arguably one of the absolute worst refereeing performances in world cup history. i feel fairly certain that i am just in saying this because we actually have neutral, third party commentators agreeing with me. while the obviously biggest blunder of the game was coulibaly’s fantom call to bring back maurice edu’s game winning goal, his performance over the entire course of the game can best be described as awful. word is that he probably won’t get to see the center of the pitch, possibly even working lines too, for the rest of this world cup. i would take that one further and say that he probably shouldn’t be allowed to referee any game, anywhere, ever again… and make him clean all of the stadium toilets in rustenburg for the rest of the world cup. not only did he kill my team’s chances of making an incredible comeback win, but he also killed the first truly stunning match of the world cup. i’m allowed to hate someone for reasons like this, right? if you’re sitting there shaking your head and thinking, “no, it’s not alright to hate someone,” let me paint a picture for you. imagine a young koman coulibaly growing up in poverty stricken mali, a country with 90% of it’s inhabitants being muslim. young coulibaly loves the game of football, but can’t play because the u.s. has pulled all of the funding from his local school which supplies their equipment. resentment from the local community towards the u.s. grows, soon consuming koman. he starts hanging out with the radical islamic crowd, as they share and nurture his growing hate for our country. and before you know it…. BAM… he’s been recruited into al-queda. knowing of his deep-rooted love for soccer, his commanders instruct koman to begin taking referee courses. using connections, money and the fear they’ve instilled in the local governments, they eventually land koman a job working games in an african soccer league. eventually, he becomes a respected referee, ultimately being named to the “prestigious” list of world cup officials. again using their extensive network of connections, al-queda arrange for coulibaly to take charge of a match between the united states and slovenia. far fetched? maybe. but it’s still completely possible. how else can you possibly explain coulibaly’s actions? i dare you to find a better explanation. I don’t write a bunch of comments, but I browsed a few of the remarks on public enemy #1 | Wrong Side of the Pond. I actually do have a few questions for you if it’s okay. folks? :-P And, if you are writing at other social sites, I’d like to follow everything fresh you have to post. Could you list of every one of your social community sites like your linkedin profile, Facebook page or twitter feed?